Adam Harvey, a graduate student at the New York University, is developing a privacy enhancing counter technology to protect individual privacy of an average person. Adam gathered information from various face tracking programs and is experimenting with images to make them undetectable by these software. 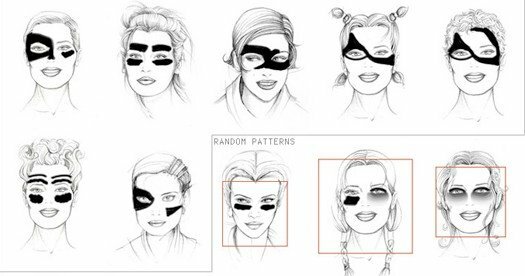 As part of this project, he used women’s faces from a fashion design book and smeared make-up in asymmetrical designs to confuse the programs and hide them from face detection. But if it is really done in close connection to the way software is working and that the makup is the result of this pattern research/generatiopn, then it's really something to go deeper into.